Patrons are expected to repair any bicycle they obtain at the Davis Bike Collective using the available resources. This is a checklist to act as a guide through this procedure. Always ask if you are unsure of something, and use the reference books if necessary. Find a frame that addresses your needs and can accommodate your desired uses. If you want to carry cargo, make sure there are attachment points for racks and baskets. If you want fenders, make sure there are places to attach them. If you want wider tires, make sure there is clearance for wider tires. If you need to carry your bicycle up a flight of stairs, make sure you can lift it easily. While there are often workarounds, it is better to start with something close to the bike you want than to try to make a different type of bike fit your needs. Inspect frame for cracks, ripples and bends. Common areas with damage are crumpled downtube and toptube near the headtube due to front end collision and broken chainstay. Check that the fork is not bent, especially bent inward due to a front end collision. Confirm that the seatpost is not stuck and the seattube is not damaged. If present, inspect derailleur hanger for damage and make sure threads are still intact. Align the derailleur hanger if necessary. Inspect brake mounting points for damage and misalignment. Make sure the bottom bracket cups are not askew or misaligned. Confirm that the bottom bracket spindle ends are not damaged and can mount the desired cranks and crankbolts. Check that the bottom bracket spindle turns smoothly and freely without binding and without play. If there are problems, now is the time to rebuild or replace the bottom bracket. If the bottom bracket has an adjustable cup, confirm that a lockring is properly installed. Check that the headset rotates smoothly and freely without binding and without play. Rebuild the headset if there are problems, replacing damaged parts and adding new grease. 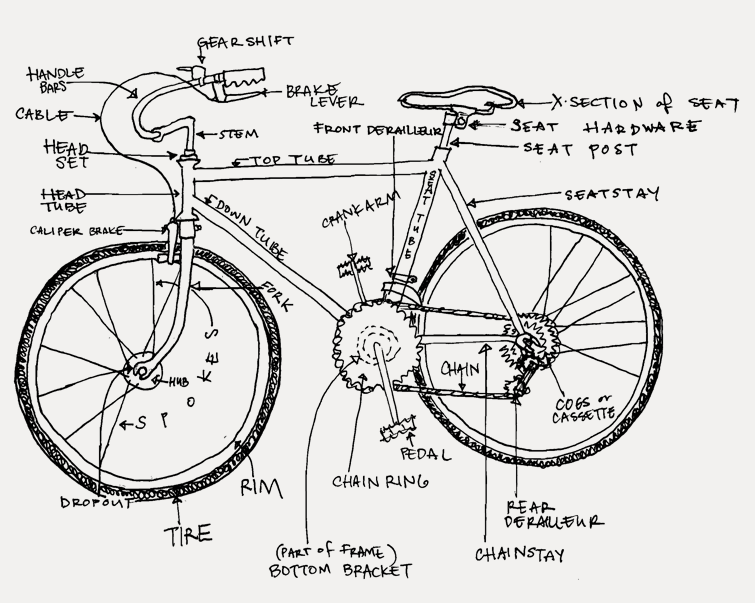 Make sure the wheel has the correct axle spacing and rim diameter for the bicycle. For a rear wheel, make sure it is compatible with the desired drivetrain. Check rim for severe wear (such as a dished braking surface) or damage. Determine whether any damage warrants a new rim or wheel. Check if wheel axles are broken, bent or extremely out of adjustment. Determine if it is repairable and repair if possible. For a rear wheel, make sure that the freewheel, cassette or fixed cog is operating correctly and properly installed. Spin the wheel and check for extreme wobble and broken or missing spokes. Replace broken and missing spokes. True the wheel, if necessary. Check that rim has a properly fitted rim strip that protects the tube from damage, and that the rim is free from debris and sharp edges that may damage the tube. Check tire for wear, damage, cracking and debris. Make sure the tube is appropriately sized, has the correct valve for the rim and holds air. Install the tire and tube onto the wheel. Confirm the tire is seated correctly. Install the wheels onto the bicycle. In California, bicycles operated in darkness are required to have lights and reflectors as covered in the California Vehicle Code 21201. A white light that illuminates in front of the bicycle and is visible from the front and sides. It must be either attached to the bicycle or the operator of the bicycle. A red reflector or red light with integrated reflector visible from the rear. White or yellow reflectors visible from the front and back on each pedal, shoe or ankle. A white or yellow reflector visible from both sides of the front of the bicycle (normally attached to wheel or integrated into the tire sidewall). A white or red reflector visible from both sides of the rear of the bicycle (normally attached to wheel or integrated into the tire sidewall).